New York is a pretty trendy place. Fads come and go. I mean that in a good way. There's nothing stagnant about this city. On the food front there is always something new to try whether it's a mozzarella bar or a restaurant that just serves desserts. The latest buzz is around a Vietnamese sandwich called the bahn mi. I'd never heard of it before. 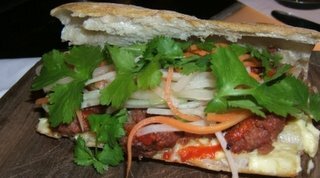 But Slashfood just posted a review for what they considered the best bahn mi in town - 5 Ninth. I've walked past this meatpacking district restaurant a couple of times. It looks more like someone's house than a restaurant and it's decidedly uninviting because it just don't look like it's open. The bahn mi is essentially a Vietnamese take on the hoagie. French bread; a spread including some kind of mayonnaise and a combination of nuoc cham and some kind of hot sauce; slivers of daikon, onion, and carrot; coriander leaves and scallion; and some kind of meat. Typically shredded or sliced pork or a Vietnamese variation on the salami. The bahn mi at this restaurant had something resembling a sloppy joe concoction. It doesn't sound like much but it was easily (easily!) the best sandwich I've ever eaten. Perfect amount of spiciness and sweetness. The mayonnaise held the sandwich together and rounded off the flavors. Divine. My only question is why hadn't I heard of this sandwich before?